“Taylor-Wharton Partners For Life” supports medical research. Taylor-Wharton is pleased to announce the “Taylor-Wharton Partners For Life” Achievement Program, which will support varying medical research fields each year. The inaugural “Taylor-Wharton Partners For Life” Campaign aims to support the ongoing challenge of finding a cure for breast cancer. According to the American Cancer Society, 226,870 individuals are expected to be diagnosed with this terrible disease in the United States this year. In addition, approximately 39,510 U.S. deaths are expected to be attributed to breast cancer in 2012 alone. “Partners For Life” aims to play a role in developing a cure to reduce these tragic statistics. 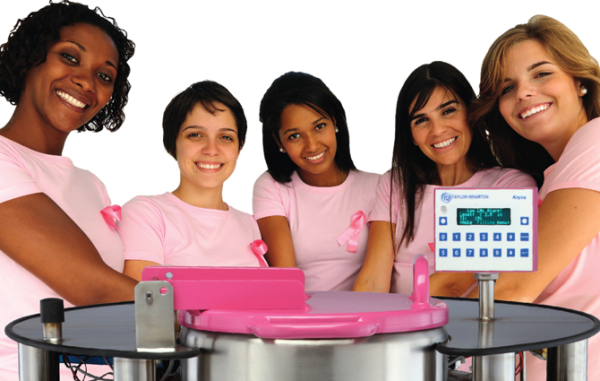 Luke Bradshaw, CryoScience Sales Manager for the Americas, stated, “As part of our campaign, Taylor-Wharton has produced a specialty-manufactured version of the popular LABS20K cryogenic freezer, incorporating the well-known breast cancer ribbon into the logo. This freezer, with specialty-designed pink accents, will be used for trade shows and other industry events across North America throughout the year.” Researchers from North America will be asked to submit a narrative on their work to find a cure for breast cancer and how this freezer could benefit the search for a cure. At the end of 2012, Taylor-Wharton will donate the LABS20K freezer, valued at over $22,000. Marie Hoover, Owner of Advanced BioMedical Laboratories, Inc (ABML), is a leading contract research and biorepository organization that partners with clients to support vaccine and therapeutic development programs. Mark R. Ackermann DVM, PhD, Diplomate ACVP is Professor; Interim Associate Dean for Research and Graduate Studies at Iowa State University. Dr. Ackermann’s area of research and clinical diagnostic expertise is the respiratory tract. His laboratory has developed a perinatal lamb model of respiratory syncytial virus (RSV) infection that has much similarity to RSV in perinatal infants. This model is used to assess innate immune responses and epithelial cell maturation/differentiation stages that may predispose the preterm and perinatal lung to RSV infection. Ackermann also is professor-in-charge of the Image Analysis and Confocal Microscopy Facility. Major funding has included the NIH/NIAID, USDA/CSREES, Salsbury Endowment, Carver Foundation. Elaine Gunter, after retiring from CDC in 2006 created Specimen Solutions, LLC, to offer biobanking and laboratory consulting worldwide. In 1999, Elaine co-founded ISBER, the International Society for Biological and Environmental Repositories, and she became the society’s first President. She continues to serve as ISBER’s newsletter editor, and participates in a number of committees and working groups for the society. In 2011 she was awarded the ISBER Distinguished Leadership and Service Award in recognition of everything she has done to establish the society as the world’s leading forum for the biobanking community. Lisa Miranda is President and Chief Executive Officer of Biobusiness Consulting, Inc. and Senior Advisor, Business Development for Bluechiip Ltd. She has over 14 years of higher education and 22 years of expertise in the clinical care, clinical and biospecimen research and biobanking related fields, which includes 15 years of research at the University of Pennsylvania, where she served as Technical Director and Creator of the TTAB Core Facility. Ms. Miranda served on the ISBER Board of Directors from 2008-2011, has volunteered for a variety of ISBER committees from 2007-present and several international working groups i.e. the Marble Arch and BRIF. Ms. Miranda founded the Biobanking Journal Club in 2011. In addition to being an ISBER member, she is also a member of the ESBB, SLAS, P3G and LRIG societies. She is based in the Greater Boston Area. Cara Kliefoth is a business development manager for Assurant Solutions in Atlanta, GA. Cara has been a key fund raiser for cancer research for many years: American Cancer Society’s Relay for Life, Susan G. Komen 3 Day Walk for Breast Cancer, and Be the Match – Be the One Run. She also has been active with the Lupus Foundation, National MS Society, and various other charities through her work with the Junior League of Atlanta. William B. Coleman, PhD, is a Professor in the Department of Pathology and Laboratory Medicine and Director of Graduate Studies for the Molecular and Cellular Pathology Graduate Program at the University of North Carolina School of Medicine (Chapel Hill, NC). The research in Dr. Coleman’s laboratory involves several major projects, including investigations related to the molecular pathogenesis and epigenetic mechanisms in breast cancer, and translational studies on targeting the breast cancer epigenome to improve therapy for triple-negative breast cancer. Dr. Coleman is co-director for the Breast Cancer Scientific Interest Group of the American Society of Investigative Pathology. More information will be forthcoming in June, 2012 on how to apply and be considered to become a recipient of the LABS 20K cryogenic freezer. Taylor-Wharton in Theodore, Alabama manufactures state-of-the-art CryoScience equipment from 1.5 liters to the largest LABS freezer that holds up to 94,200 vials. A complete line of CryoScience laboratory inventory control systems and accessories is also available. With worldwide operations and manufacturing facilities, Taylor-Wharton also produces complete line of liquid cylinders, micro bulk and bulk tank storage systems up to 110,000 gallons. For more information on the complete line of Taylor-Wharton products, call 1-800-898-2657.